We have made, and you have bought, a club or wing chair of the highest possible quality which has been hand crafted in traditional materials with skill passed down through generations and with simple care and attention it will last for generations too. Perhaps the most important part of the club chair is the leather and by following a few simple rules this will age and develop a unique patina. You would be advised not to place the leather chair next to permanent heat sources such as radiators as this will dry out the leather prematurely and this can cause uneven wear of the chair. It is never wise to us any harsh or abrasive chemicals on the leather as they will almost certainly damage this and could cause permanent staining. It may seem obvious but you should never sit or leave wet denim jeans or jackets on our aniline leathers as the colours can run off and staining can result, which again can be permanent. Simple procedures such as regular dusting which will prevent grime penetrating the grain of the leather. We supply approved leather cleaners and you should regularly clean with this product which will feed the leather and keep it supple. To summarise; every day dust with a lint free cloth, with the exception of our aniline leather you should wash down your chair with warm water and a lint free cloth and then brush with a soft brush to revive the finish. Every month using the approved leather cleaner, clean and feed the chair which will prevent drying and cracking of the surface. Be careful of studs on jeans these can be lethal to the finish on your chair and responsible for terrible scratches and scrapes on the surface of the leather which are almost impossible to remove. Spilling red wine can be easily removed by blotting this immediately with a terry cloth and soaking in warm water. Remember to feed the leather afterwards. 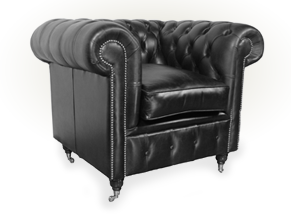 Over time your club chair will gracefully age and develop its own patina, colour variance in high traffic areas will show and creases will appear giving your leather chair its own characteristics, which you will grow to love.